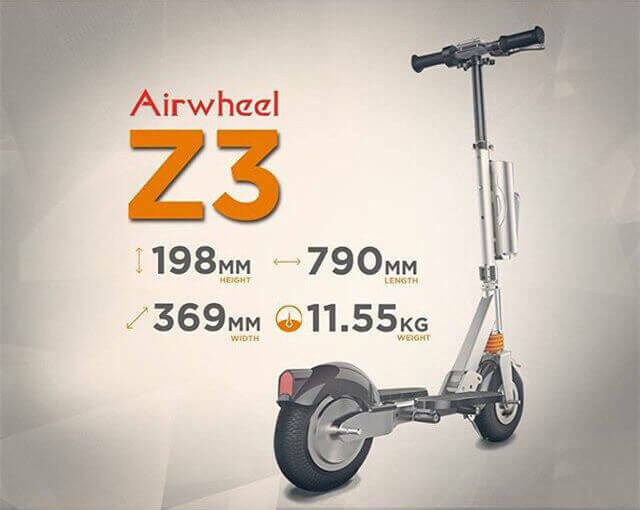 Abstract: There are four new products released by Airwheel in Sep, 2015, including Z3 two wheel electric scooter. And we have talked too much about Z3's features, such as smart phone app, adjustable operating arm, replaceable and up-equipped battery design, but the parameters are seldom mentioned. As known to all, there are four new products released by Airwheel in Sep, 2015, including Z3 electric hoverboard. And we have talked too much about Z3's features, such as smart phone app, adjustable operating arm, replaceable and up-equipped battery design, but the parameters are seldom mentioned. This time, the parameter description of Airwheel Z3 electric skateboards will be analyzed in detail. For the range, the capacity of the lithium ion battery is 162.8WH with the range of 20km in theory, as it is influenced by the road conditions, temperature and riders' weights and so on. As for the intelligent management, riders can monitor the scooter anytime and anywhere in real-time with the smart phone App, which is compatible with Android and IOS. See more information in Product Manual. Some may wonder the product warranty. The warranty is one year for the main body, half a year for the batteries & chargers. The easy-consuming parts such as tires and fenders are not covered by the warranty. As for the ways to get after sales support at local distribution, purchasers can leave message at Airwheel official Facebook & website or Email directly to sales_supprt1@airwheel.net. Please describe the malfunction in details and the services you needed. Airwheel intelligent electric scooter will inform the local distributors to provide after-sales for you. Since Z3 is a multi-foldable electric scooter, there is a Product Manual inside the packing box to explain the specific steps of installing the scooter. If it is less helpful, users can search the installation video in Airwheel official website. Also, users can find the learning tips in the Product Manual. If it is less helpful, users can search the training video in Airwheel official website. Previous：Battery and charger play a decisive role in electric scooter.